A team of researchers at Norwegian University of Life Sciences has found that horses are capable of reading symbols on a sign and using them to convey a desire—whether they want a blanket put on them or not. The researchers have written a paper describing their efforts with the horses and have had it published in the journal Applied Animal Behavior Science. Scientists and horse-people have known for many years that horses are reasonably intelligent—they can be trained to do a wide assortment of tasks and have been known to communicate with humans through various means, such as stomping feet, biting or knocking holes in stall walls. But now it appears they also have an ability to recognize symbols and to ascribe different meanings to them. Suspecting that horses might be smarter than believed the researchers created three signs for the horses to look at—one was pure white, one had a black horizontal bar on a white background and the third had a black vertical bar on a white background. The researches then spent two weeks training riding horses to read the signs and then to use them to indicate to their human companions whether they wanted a blanket to be placed on their back, to have an existing blanket removed, or for things to remain the same. The researchers report that after just 11 days the majority of the horses had caught on and were actively using the signs to report their desire—at the two-week period all of the horses were onboard and were actively using the signs to express their wishes. The researchers also report that the choices made by the horses were not random—they would choose to have a blanket put on when it got cold, for example and ask to have one removed on warm days when they were sweating. The researchers also report that the horses appeared excited at being able to communicate with their trainers in such a novel way, engaging eagerly in the training and responding sometimes before being asked. They note that their study showed that the horses were not only able to read the symbols but were able to understand the connection between them and real world consequences—a form of higher learning. This paper describes a method in which horses learn to communicate by touching different neutral visual symbols, in order to tell the handler whether they want to have a blanket on or not. Horses were trained for 10–15 min per day, following a training program comprising ten steps in a strategic order. Reward based operant conditioning was used to teach horses to approach and touch a board, and to understand the meaning of three different symbols. Heat and cold challenges were performed to help learning and to check level of understanding. At certain stages, a learning criterion of correct responses for 8–14 successive trials had to be achieved before proceeding. After introducing the free choice situation, on average at training day 11, the horse could choose between a "no change" symbol and the symbol for either "blanket on" or "blanket off" depending on whether the horse already wore a blanket or not. A cut off point for performance or non-performance was set to day 14, and 23/23 horses successfully learned the task within this limit. Horses of warm-blood type needed fewer training days to reach criterion than cold-bloods (P < 0.05). Horses were then tested under differing weather conditions. Results show that choices made, i.e. the symbol touched, was not random but dependent on weather. Horses chose to stay without a blanket in nice weather, and they chose to have a blanket on when the weather was wet, windy and cold (χ2 = 36.67, P < 0.005). This indicates that horses both had an understanding of the consequence of their choice on own thermal comfort, and that they successfully had learned to communicate their preference by using the symbols. 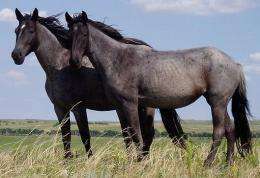 The method represents a novel tool for studying preferences in horses.